Old key punch models, 1890 through the 1930s. 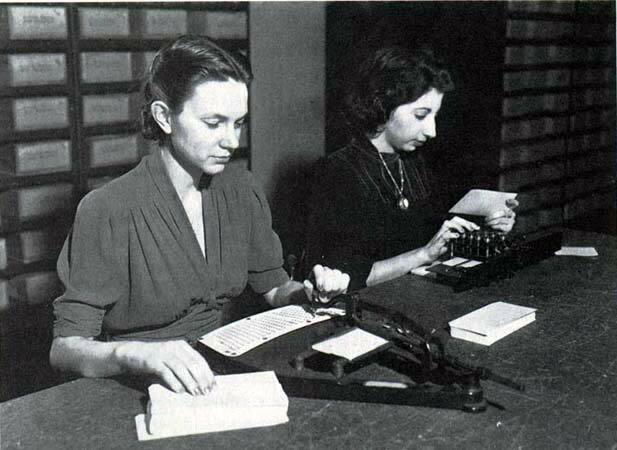 Originally developed for the US census, punched cards quickly spread to business and eventually government and science applications. 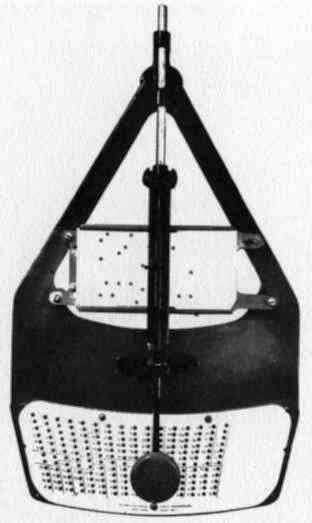 Herman Hollerith's Pantographic Card Punch, developed for the 1890 US census. Photo: . Prior to 1890, cards were punched using a train conductor's ticket punch that allowed holes to be placed only around the edge of the card, and was not terribly accurate, and which tended to induce strain injuries. The Pantographic punch allowed accurate placement of holes with minimum physical strain, one hole at a time, and also provided access to the interior of the card, allowing more information per card. A skilled Pantograph operator could punch 700 cards per day. This photo was taken during the 1920 census . CLICK to enlarge. This shot is from the Stanford University History Exhibits, which identifies it as the IBM Electric Key Punch (1923): "Adding relays and magnetic coils to the punches that were used to enter data greatly reduced the data entry effort. This machine is from the 1930s. The card had 80 columns, to hold 80 digits. Punching the X-key, above the digits, indicated minus. We still find many data files in commerce today that are 80 characters wide. Alphabetic characters could be entered by punching the top key and a digit 1-9 in the same columns for A-I, the X-key and 1-9 gave J-R, and 0 and 1-9 gave S-Z." Austrian  says, "Although this IBM key punch resembles earlier Hollerith models, electricity has been added to lighten the job of punching. ... Hollerith's systems opened up an important new field of employment to women, starting with the 1890 Census." Prior to 1928, IBM cards were punched with round holes; originally in 20 columns, but by the late 1920s, 45 columns, as shown in this New York University registration card, reproduced from Baehne . All punches introduced prior to 1928, including the 016, used round holes and 45 or fewer columns. Beginning in 1928, IBM cards had rectangular holes 80 columns across, as shown in this Iowa State University registration card, also reproduced from Baehne . 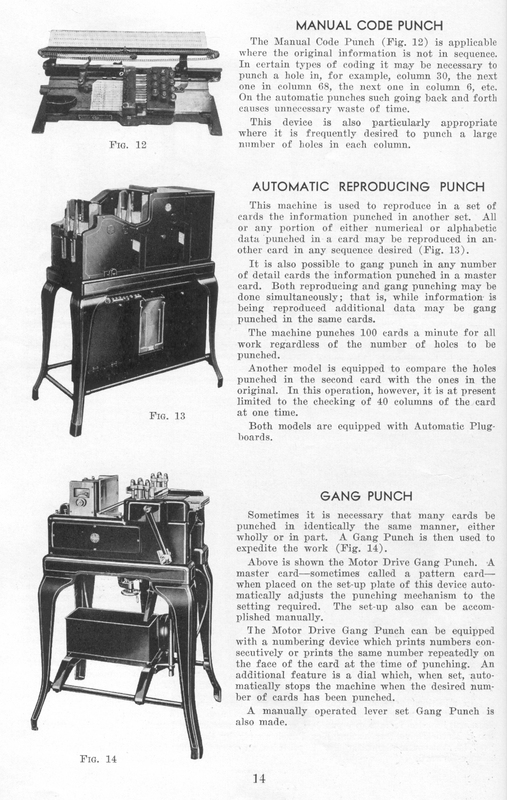 All punches introduced after 1928, including the Types 016, 31, and 32 and possibly the 011, and of course the later 026, 029, and related models, produced 80-column cards. Photo: ; CLICK to enlarge. 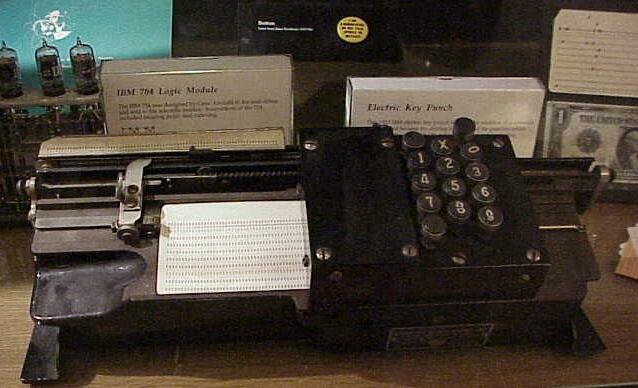 The IBM Type 016 Motor-Driven Electric Duplicating Key Punch, introduced in 1929, the kind used in Columbia's Statistical and Astronomical Laboratories, and later in Watson Scientific Laboratory. 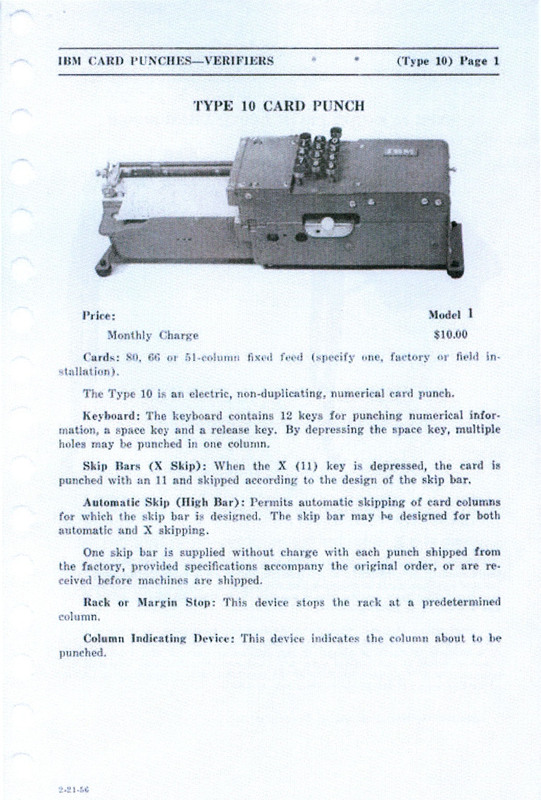 This was IBM's first punch with automatic feeding and ejecting mechanisms; it was marketed until 1960. The punching is done magnetically, and information from one card can be transferred automatically to another by a duplicator. The keyboard contains 12 punching keys, one for each row on the card. There are also space and eject keys. A master (program) card can be used to control automatic tabbing and duplication of fields. A skilled operator could punch 100-200 cards per hour on this model. Herb Grosch recalls, "You put a stack of blank cards in the feed [right], a single card, part of which you wanted to duplicate ('master card'), in the to-and-fro rack, and clipped a skip bar to the front of the carriage (p.82). A notch said skip, a deeper notch said copy." 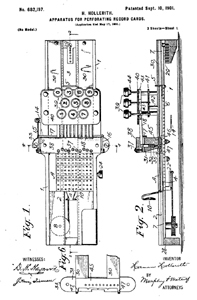 This is the IBM 032 Printing Punch of 1933. 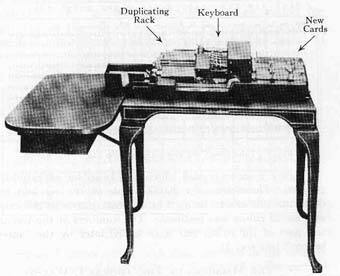 This was the first key punch machine capable of punching letters as well as digits (except by multipunching) and of interpreting the punches by printing across the top of the card. 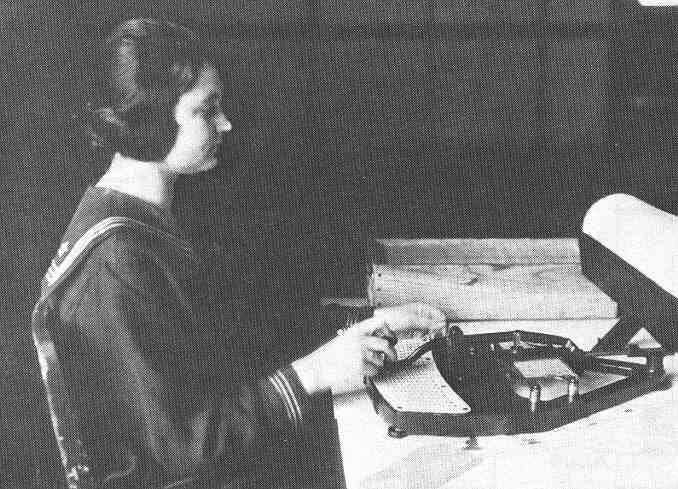 It was used by the US Army in World War II for Morning Reports and such. Yet the brand name appears to be Hollerith! CLICK HERE for another photo. Photo: ; CLICK to enlarge. The IBM Type 31 Alphabetical Duplicating Punch, a motor-driven key punch from 1934, with a typewriter-like keyboard and a separate numeric keypad . 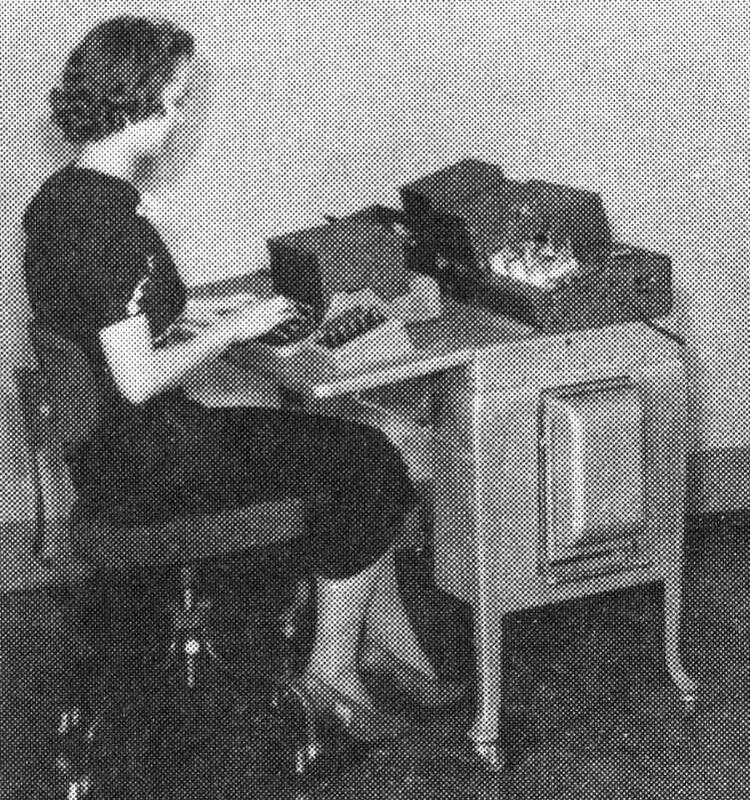 This model (which was current with the release of the IBM 405 accounting machine, used the new (1928) standard 12x80 cards and was almost certainly in use at the statistical and astronomical laboratories, BASR, and elsewhere at Columbia prior to the introduction of the 024 and 026 models in 1949. CLICK HERE for a closer view of the alphabetic keyboard, "similar to a conventional manual typewriter except that the shift, tab, backspace and character keys were eliminated, and a skip, release, stacker and '1' key were provided" (IBM History Archive). 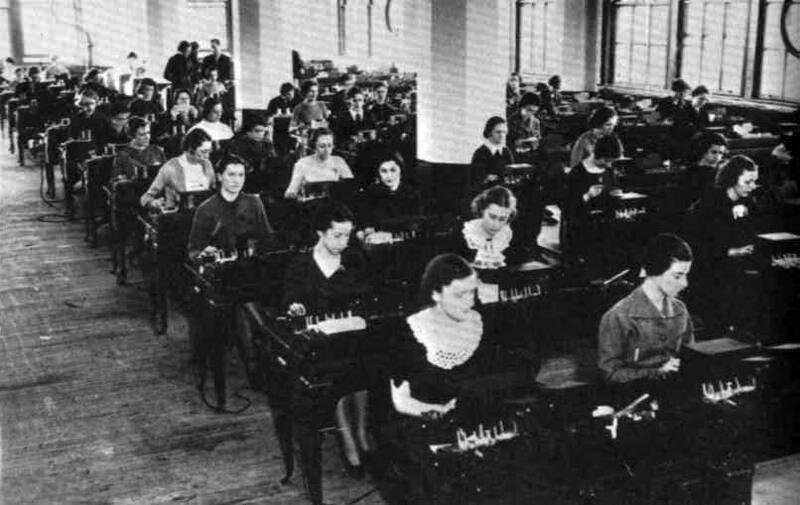 Type 31 punches at the US Social Security Administration, circa 1935. Photo: , CLICK to enlarge. CLICK HERE for a gallery of a recently excavated IBM 031 at the Iowa Department of Transportation, and the story behind it. Also see: IBM 024 and 026 punches, The IBM 29 Card Punch, The IBM 129 Key Punch.